Learn how to channel your power to be able to evenly express your spirit through optimal alignment of your head, neck and shoulder girdle. We will practice to access and guide the energy in your upper back so that you can feel empowered and easeful in what you do on and off the mat. EVOLVE YOGA 2019 TEACHER TRAINING ANNOUNCED!! Led by rotating Evolve Teachers! 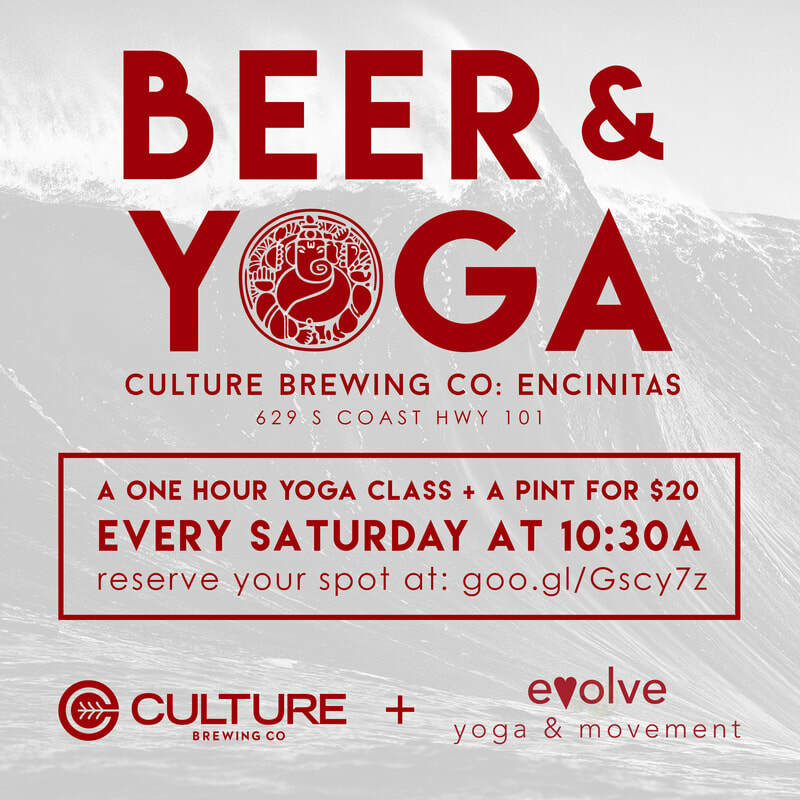 Join us weekly for a special 60 minute Beer Yoga class led by Evolve teachers hosted by our friends/neighbors at Culture Brewing Encinitas! $20 includes a 60 minute yoga session and a pint of your favorite Culture Beer! Evolve Party Pass Members: only $5! You will need a mat and a towel. Class is non heated. Some photos of our most recent October YOGALECTRICA workshop with Nicole Marre and DJ Arielle! Black lights, glow sticks, funky flows and a Live DJ. Stay tuned for our next offering of this unique yoga party!! Most Workshop Party Passes are $40. 10% off for Monthly & Annual Unlimited Members.